This post is from Will Talbot, a very good friend if mine who recently moved to South Africa. A bit of an out if the way location, but it looks like tasty beer. Take it away, Will! Arriving at South Africa’s youngest brewery we noticed earlier visitors eagerly loading four cases of Chris Heaton’s beer into their boot. This gave us an indication that this may not just be a pleasant first stop on a pub crawl but a tasty treat too. 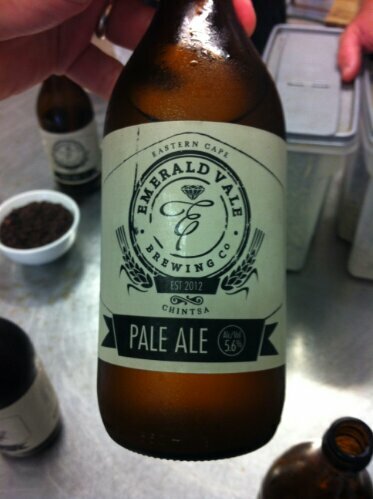 Chris currently makes about 6,000 litres of ale a month at the Emerald Vale brewery, ranging from Pale to Gold and Dark ales. He tells us that his interest in brewing started as a schoolboy, concocting illegal brews out of sight from the boarding masters and to the delight of his dorm mates. This turned into a hobby in later life and is now a passion from which he earns his living. Chris’ earlier career in construction means that the rooms and machinery he uses are all built by him and often salvaged combinations of brewing tools and household plumbing equipment. We taste the Pale Ale which is surprisingly clear for unfiltered ale, crisp to taste and has a lovely aroma. The Pale Ale is fermented for 14 days and then is laid down for a further fortnight. He uses a combination of Southern Star and Cascade hops, only the best Belgium yeast and pure rainwater, collected from the farm roofs on the property. Chris explains that the tin roof runoff gives the water added zinc, which then helps the yeast in a way that I can’t fully understand but certainly does wonders for the end product. at the most demanding time of the company’s five months in business. December was always expected to be the busiest time for the brewery that supplies local hotels and pubs which always see a surge at that time, being the start of the summer holidays in the southern hemisphere. 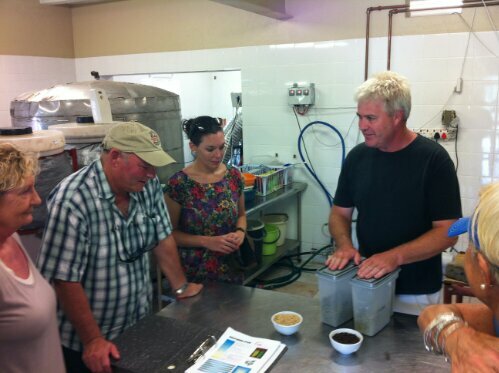 Quite uniquely, rather than capitalising on this holiday rush to feed further expansion, Chris is planning to reduce production to 5,000 litres a month in 2013. This will help him focus on the solid selection of ales he’s established and make incremental improvements to each of them, in order to reach his required taste and quality. Luckily for the local residents and brewery visitors that get to enjoy the Emerald Vale ales, Chris Heaton’s standards are very high! If you’d like a visit, you can find the brewery operating from a cattle and goat farm on the Chintsa road (or ‘Cintsa’, depending on which road sign you read). Chintsa lies on the Atlantic Ocean about 15 Km from the N2 highway and about one hour from South Africa’s only river port, East London (which is definitely not cockney). Indian Ocean, Will, not the Atlantic!!! !